Linguists recognize ASL as a fully-developed human language with its own lexicon, syntax, and morphological processes, one of over 100 naturally-occurring sign languages in the world. ASL lies at the heart of a unique culture. Deaf people who sign form a tightly-knit community with distinct social norms, values, and traditions. They have developed a growing body of literature, including ASL poetry, stories, and plays, many of which are now available on video or DVD. 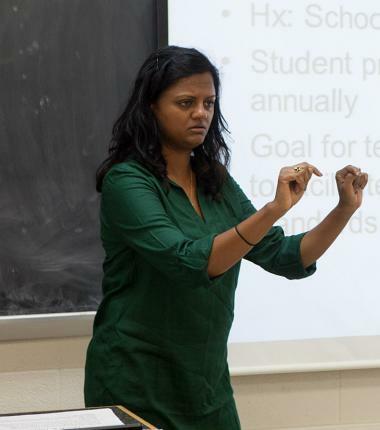 Since 1998, students in the College of Arts and Sciences have been able to use ASL to fulfill of their foreign language requirement. Usually occur on the third Wednesday of each month at a local restaurant. All are welcome; the only rule is no voicing. Focuses on multiple aspects and experiences of Deaf people around the world. Welcome to the University of Virginia's American Sign Language Program. The University is committed to offering rigorous classes in languages, literatures, and cultures, and since 1996 we have been part of that effort. Since 1998, students in the College of Arts and Sciences have been able to use ASL to fulfill of their foreign language requirement. More.